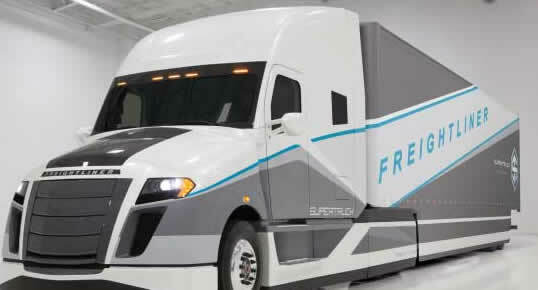 The amazing improvement in freight-mile efficiency achieved under recent tests for a new SuperTruck design from Daimler Trucks and its US Freightliner brand. The truck was the latest one developed under the US Department of Energy's SuperTruck program, which had a goal of just a 50% rise such efficiency. In tests with a truck and freight weighing a combined 65,0000 pounds, the Daimler truck achieved an average of a remarkable of 12.2 mpg, almost double the levels of trucks currently on the road. Daimler received some $40 million in matching funds from the DOE for the program, and partnered with engine maker Detroit Diesel in the effort. The mileage improvement comes from a variety of innovations, including much more aerodynamic tractor and trailer designs, low resistance tires, and greater intelligence built into the drive train. Daimler qualified the news by noting that some of the components used in the prototype truck may not be commercially viable at this point. That's the average number of days that the latest generation container megaships (18,000+ TEU capacity) are spending in port loading and unloading on Asia to Europe tours, versus just 12 days with the previous generation (13,000 TEU) ships, according to a recent blog post by Drewry Shipping . That is based on three Asian pickup and three Euro drop off stops (there are no US ports capable yet of handling these mega-mega-ships). That means importers in Europe are waiting several extra days in many cases to get their boxes. The most basic issue: the new giant ships are not just getting longer but wider and higher. This means the number of gantry cranes deployed per ship cannot rise proportionately to the increase in the number of containers. For example, the length of the 18,300-TEU Maersk Triple E vessel is only 25% longer than the 7,400-TEU Regina Maersk class, yet carries 150% more freight. The small number of lines of software code Amazon.com says might only be required for a product company to connect its products to its new Dash Replenishment Service. The new program is designed so that consumers can very easily or even automatically order consumables for various products around the home, from laundry supplies to water filters. Under the program, manufacturers can install an "order button" on their products that consumers can configure to simply press to order a consumable from Amazon. Or, the system can be set up to monitor consumable usage and send an order automatically to Amazon when supplies are low - for example, it would know after so many washing machine cycles that the supply of detergent is getting low. Whirlpool, Brita and Brother are among the manufacturers planning to participate in the program. That's the number of consecutive months of US manufacturing sector growth, at least according to the Institute for Supply Management's Purchasing Managers Index. 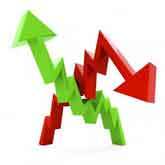 The index was over the 50 mark that separates expansion from contraction yet again in March, ISM reported this week. But that string may be in jeopardy - the March number came in at just 51.5, a decrease of 1.4 percentage points from February’s reading of 52.9, which in turn was down from January, etc. Many thought March might show a rebound, as production that didn’t happen in February due to very bad winter weather in much of the country would be pushed into March, but that apparently didn’t happen. This is a number to keep an eye on.